This highly original Mark I Saloon still presents in its original color combination of Black and Cinnamon. Its leather interior has been kept in its original condition, showing slight patina, which is normal for a car of this age. The rest of the interior is just as original, from its polished wood dash and steering wheel, split bench seating, and its Smiths gauges. The Mark I is scheduled for a full mechanical service, and an aesthetic detailing, but the paint and chrome are good and serviceable as is. The Saloon is a great candidate for the collector that desires to take this car to a higher level such as Show/Driver, or Show, level condition. This Jaguar may be purchased "as-is", or you may commission Classic Showcase to restore it to the level of your choosing. Mark I examples are one of the rarest models in the family of Jaguars, and as such, rarely come on the market, especially in such nice condition. The Jaguar 2.4 Litre Mark 1 is a British saloon car produced by Jaguar between 1955 and 1959. Referred to in contemporary company documentation as the Jaguar 2.4 Litre and Jaguar 3.4 Litre. Its designation Mark 1 followed its October 1959 replacement by Jaguar's 2.4-litre Mark 2. The 2.4 Litre was the company's first small saloon since the end of its 1½ and 2½ Litre cars in 1949, and was an immediate success, easily outselling the larger much more expensive Jaguar saloons. The 2.4 Litre saloon was announced on 28 September 1955. The 3.4 Litre saloon announced 17 months later in USA on 26 February 1957 was designed for the American market and was not at first freely available on the domestic market. The Mark 1 was initially offered with a 2.4 Litre short-stroke version of the XK120's twin-cam six-cylinder engine, first rated at 112bhp nett by the factory at the launch in 1955. 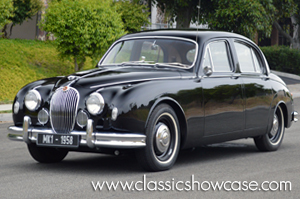 From February 1957 the larger and heavier 3.4 Litre 210bhp (gross) unit already used in the Jaguar Mark VIII also became available, largely in response to pressure from US Jaguar dealers. Wire wheels became available. The 3.4 had a larger front grille for better cooling, a stronger rear axle, and rear-wheel covers (spats) were cut away to accommodate the wire wheels' knock-off hubcaps. The 2.4 Litre was also given the larger grille. After 200 cars had been built and sent to USA and just prior to the car's announcement a major factory fire destroyed 3.4 Litre production facilities. In September 1957 a three-speed Borg-Warner automatic transmission previously an export-only option became available with either engine and Dunlop disc brakes for all four wheels were made available as an optional extra on all Jaguar models except the Mark VIII saloon. 19,992 of the 2.4 and 17,405 of the 3.4 Litre versions were made.